The CX teams extended their spring break with a twist, heading to Austin where they spent their time fighting for wins and a shot at finals. Junior Colby Menefee accomplished a first for a BHS student, earning top speaker in the 3A competition. 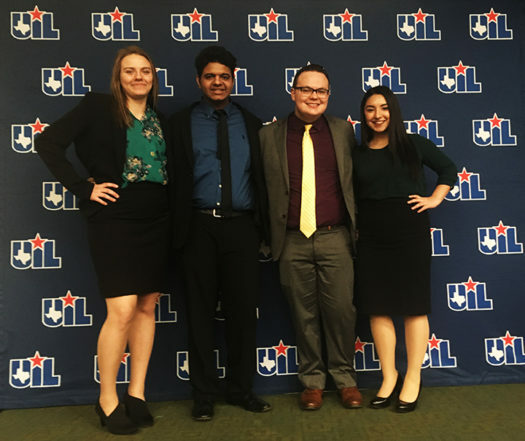 Two Buffalo teams advanced to state, and both competed in four rounds on day one for preliminary rounds. Juniors Molli Dittmar and Nishit Tailor, competing at the state level for the first time, finished their day with a 2-2 record. Junior Colby Menefee and senior Andrea Garcia finished the day with a 3-1 record and advanced to finals on day two. Freshman Omar Almeida, who was part of a state alternate team, traveled with the group as well. Finals were single elimination; Menefee and Garcia made it to the octo-final round but they were knock down. They got an award for them advancing to octo-finals. This elimination round is where 16 competitors/team remain were knocked out at the octafinal round in a split decision. The team spent most of their hours in Austin competing, but students did have a chance to see the UT campus.